Holy Week from the Bible using handprint illustrations. 10 kids and a Dog! 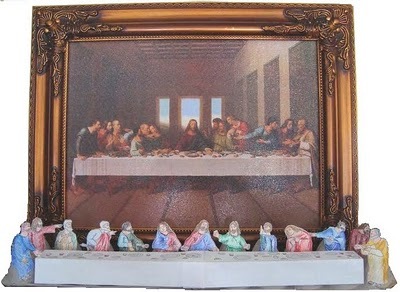 marble paintings– we are totally making them this year! stand up crosses at Lord, Make me a Saint. celebrate Jesus praying at the Garden of Gethsemane. The Diary of a Sower. stations of the cross crafts. 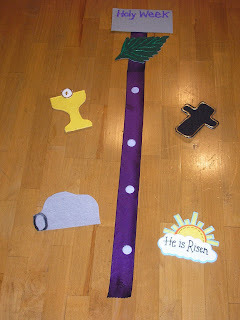 I have a post on Palm Sunday Crafts, too! These are AWESOME! Now I just have to find time to do them. these are excellent crafts. we will definitely try some at our house. thanks. Hi Lacy~Oh darn, I saw your Holy Week linky was closed. This was a fun newspaper art project. Just thought I’d share since you enjoy interesting art. I was skeptical at first but LOVED the results! Blessings to you! 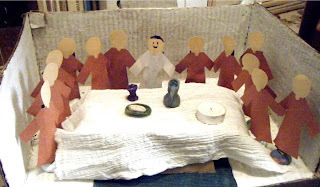 Great ideas to get the children involved during Holy Week! I especially like the last supper reconstruction. Was this made just using card and fabric?